I stumbled across this title from a website about low profile horror movies and immediately hunted down a copy. The poster, for one looked promising. Obviously, I was successful so I was able to check out this American remake of a Thai horror comedy called 13 Beloved. Rest assured, there’s nothing comedic about 13 Sins, which is a darned good thing. Elliot Brindle (Mark Webber) is a mild mannered salesman responsible for the care of his racist father (Tom Bower), his mentally handicapped brother (Devon Graye), and his pregnant girlfriend (Rutina Wesley). He does so willingly and without complaint because of his kind heart. But when everything falls apart before his wedding, he finds himself at the end of his rope. Just then, a mysterious phone call gives him the opportunity to earn millions in the space of 36 hours. According to the voice, the game is comprised of 13 challenges. It starts off pretty innocently but as with most suspicious calls, the challenges soon take a nefarious turn and Elliot soon finds himself the subject of a police manhunt led by Detective Chilcoat (Ron Perlman). I think 13 Sins is one of those films that starts out inauspiciously but grows in strength with the passage of each minute. Mark Webber does a pretty good job in portraying the meek lead character and really comes across as someone that audiences can empathize with, even during the challenges when he evolves into someone far different. First off, what I really liked about the film was the fluidity in the storytelling — the buildup to the suspense and the gradual changes in the trend of the challenges as well as Elliot’s character which is illustrated by his reaction to the new tasks posed by the voice. I think the story dictated the tone of the film and enabled it to set the focus on the characters and the situation so the audience also become absorbed in the moment. Kudos to writer/director Daniel Stamm (The Last Exorcism) for successfully creating a film that gets audiences to question whether or not they would have made the same choices as Elliot or walked away from the growing pile of money waiting to be collected after the last challenge. When audiences begin to compare themselves to a character, it just means that they are able to relate to what they are seeing and that’s always a positive. I must admit that at first, the film reminded me of Saw. But I realized as it moved forward, that it was able to break away from the mold and create its own great moments of horror. Like Saw, there was a great story behind the brutality rooted at a strong connection between the characters that was revealed towards the end of the movie. But unlike Saw, this was more about the psychology of one person and the extent to which he can hold on to his humanity when pushed to the edge. All in all. 13 Sins was a great horror and I’m glad that it chose to go dark instead of the horror comedy route the original Thai version took. This made the film more legit. 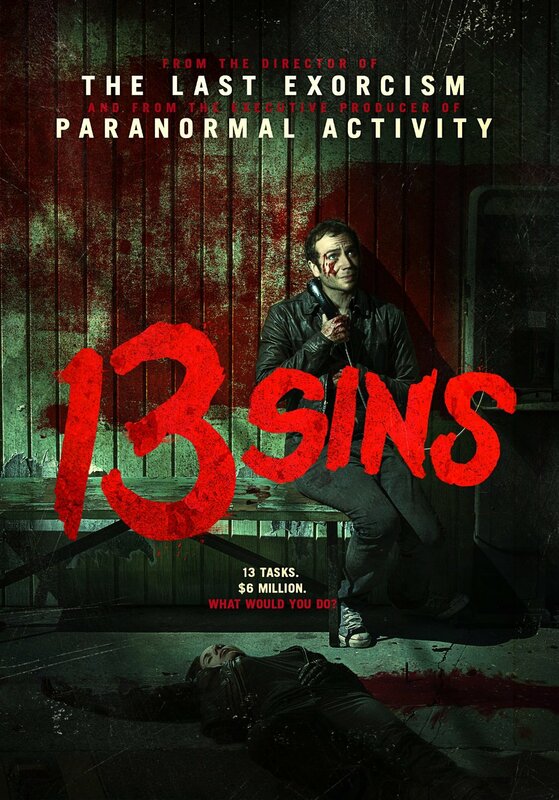 Its true that 13 Sins was not the first movie of its kind and it did share the same premise as other psychological thrillers before but it stood out from the rest because it was intelligently written (with great parallelisms to drug addiction), well acted and inventive in its approach to the execution and in the end, everything just blended together marvelously. And when audiences have a lead character they can totally root for, its hard to screw that up. It was cool to see Tara from “True Blood ” in something else.